It was a memorable evening for senior outside hitter Jada Stotts as she joined elite company, becoming the 13th Lady Gov to record 1,000 or more kills in her career. But after reaching that mark, Stotts just smiled as her teammates congratulated her following a stoppage, and went back on the court like it was nothing. Stotts finished with 22 kills and 23 digs, leading the team in both categories, but the goal coming into the match wasn’t accomplishing a historic feat. 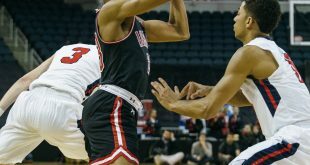 It was about defeating UT Martin in the first Ohio Valley Conference contest of the season. On Friday, APSU defeated the Skyhawks, 3-2, and while it appeared to be a runaway match at halftime, the Lady Govs had to muscle up in hanging onto the thrilling win. APSU (7-10, 1-0 OVC) stormed out of the gates in the opening set, but the Skyhawks (7-8, 0-1 OVC) gave them everything they could ask for. However, the Lady Govs held their own in the back-and-forth encounters, and in the end, won the always important first set, 28-26. 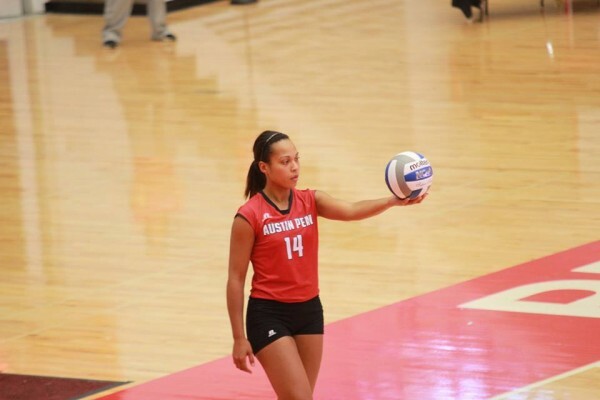 The second set was less chaotic for APSU, but despite winning 25-21, they suffered a blow as senior middle blocker Hillary Plybon went out with an injury. After getting her right ankle checked by a trainer, she did not return to the match. Sets three and four belonged to UT Martin, who did not back down from the home team. A couple APSU errors in the third would open the door for the Skyhawks to knot the score, and would pull away to claim it, 25-22. In the fourth, the Lady Govs got off to a rough start, and as the confidence level dropped, UT Martin remained confident in forcing a fifth set. But Stotts stepped up when her team needed her the most. 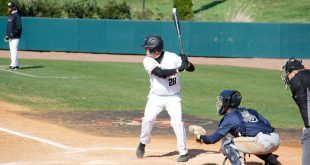 UT Martin gained a 9-7 lead, but it was quickly reversed with Stotts being on the receiving end of three of the final four points, propelling APSU to win, 15-11. Redshirt sophomore Sammie Ebright reached a new career-high in kills with 16, while Samantha Strother chipped in 12. Junior setter Aubrey Marsellis remained busy in the middle, dishing the ball to her teammates with 55 assists. The Lady Govs will be back in action on Saturday, Sept. 27, playing host to Southeast Missouri at 2 p.m.